As gardeners, we learn just how important the right companions are to our plants. Many act as a host to beneficial insects to help combat those who come to destroy! They can also cover up shortcomings when a plant’s beauty begins to fade. It is the same way for us! We need the companionship of others. They help us grow and learn, but so much more–with the right companions, success is more fun and failure is not so bad. In a group we can accomplish much more together than we can on our own. Learn. Grow. Share. Serve. Create Awareness. Celebrate. As you know, I am a big believer in Social Media! I truly believe social media is shrinking our world and giving us easy access to those who used to be so far away … some even in our own neighborhoods. Our pace of life is often fast and on the go! Multi-tasking has come and gone out of favor more than once. Much joy is brought to my life by being up close and personal with family, friends and those who share my love of gardening and roses. In this organization I have met some amazing people of all ages. We are all at different stages of the gardening experience and have different passions. Some are into just growing while others with the competitive spirit, enter the most amazing blooms and arrangements in competitions! We have those who use chemicals and others who are all organic. We spend time enjoying all things “rose” together. We learn, we laugh, we celebrate successes and we deal with failures & issues together. It’s not just roses that keep us together, over the years–we have become family. As a member of the ARS, I receive their award-winning magazine and informative newsletters. I have learned about the bigger picture of roses on an international scale! I’ve had the opportunity to attend national conferences where you meet and learn from rose lovers from around world. At these conferences, I have met many rose loving friends who I first “met” online, as well as experts in the field who have become cherished friends. Our newly installed ARS President, Pat Shanley, joined us on Rose Chat a few months back to share her dreams and goals for ARS. Take a few minutes and listen to this passionate and energetic leader share her story…HERE. 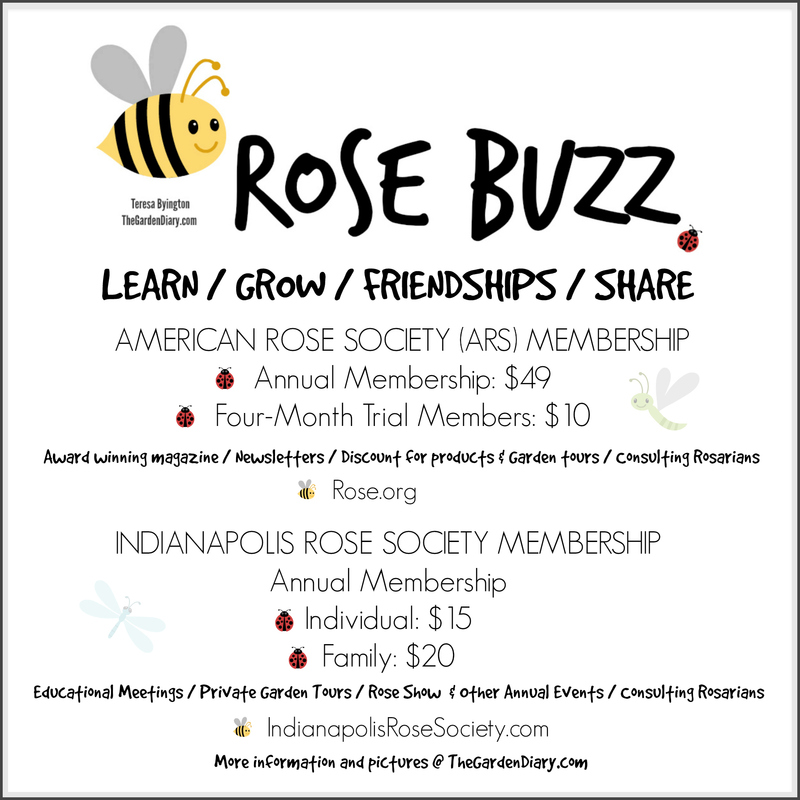 Feel free to share this post and/or the Rose Buzz graphic to help spread the news! Is 2016 your year to join? unfortunantly the dormacy period has arrived and roses are starting to wind down, winter is such a drag, but hey it allows us to dream about spring!!!!! now if predictions are correct this winter will be a mild one, I hope it willl be would be nice to have a mild winter for a change. enjoy your roses as long as you can. this week is esepcially supposed to be nice. so get out there and enjoy your garden your friends and anyone else you strike up a conversation with.